Today's guest blogger is Devanie Angel from Easy Cupcakes, which features, yes, cupcakes that are easy to make and decorate, and her she offers up some great decorating tips which you can start using...right now! Hi, I'm Devanie Angel from EasyCupcakes.com, and I'm so honored to be invited to guest blog on Cupcakes Take the Cake, the cupcake blog! I started EasyCupcakes.com in September 2007 after I decorated a batch of cupcakes with the help of my son, who was almost 3 at the time, and then decided to take a few pictures before they got chomped by a gang of preschoolers. 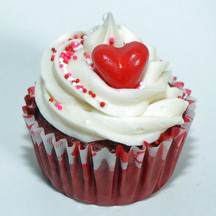 Each blog post on EasyCupcakes.com is simply a photo of a cupcake, along with "What You Need" and "How to Make It." 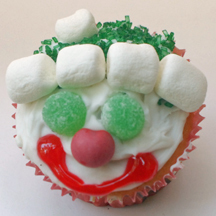 The site also has tips on baking cupcakes, mixing and coloring icing, decorating with tubes and tips and other basics. My cupcake philosophy, like my approach to the blog, is simple: Sometimes, it's all about the cute decorations. Believe me, I enjoy a gourmet cupcake as much as the next person, but I’m not an accomplished baker by any stretch of the imagination. I use cake mix from a box and although I have three Wilton courses under my belt (and the dried-up, leftover fondant to show for it) and can whip up some mean buttercream icing, I'd just as soon used canned. I believe there are some situations in which it's good to take the easy route when it comes to cupcakes. One is if you're baking for kids. Even the most sophisticated of young palates would rather bite into a Rudolph the Red-Nosed Reindeer cupcake than red velvet. They're just going for the sugar rush. You'll also want to forgo elaborate cupcake recipes if you don't really like baking. There are so many awesome cookbook authors, bloggers and Flickr pool members out there who create gorgeous cupcakes that must taste as good as they look, and I can tell it brought them a lot of joy to make them. Me, not so much. My husband (who is also my cupcake photographer) is the cook in our house, and for me, baking the cake is just a means to an end: the decorating! And sometimes you're just in a rush. You can still shine at the bake sale or office party by wowing them with the decorations. You may not win any culinary awards, but the cupcakes will still taste good. As a bonus, you'll have less kitchen mess to clean up. 1. Paste food coloring. Once you try paste, you'll never go back to liquid food dyes. The color is richer, a little goes a long way and the ability to mix colors means you'll never be at a loss for that perfect shade of pink. Yes, I use boxed cake mix but I'm a dye snob. 2. Candy eyeballs. I feel like I'm cheating every time I use them, but darn, they're so perfect! I stock up at a cake supply store every time I visit the in-laws in Southern California, but you can also order them online or make them yourself. 3. Lots of liners. I have a large and growing collection of cupcake liners. I tend to get a little matchy-matchy with my liners and cupcakes, and I like to have a lot to choose from. I've also learned that if you want paper liners to show off nicely in photographs, it's best to use white cake mix. 4. 1M swirl metal tip. Most of the cupcakes I post on EasyCupcakes.com can be made without using a pastry bag or even the plastic-bag-with-cut-corner technique. And when there are "piped" elements, I often use icing in a tube. But it doesn't take long to master the 1M swirl, and once you do, you can add sprinkles and a themed element and have a classy cupcake in no time. 5. Substituting. Not a thing but a concept. I'm lucky; the town I live in has an old-time candy shop, so they have random stuff like licorice Scottie dogs and seasonal candy corn. I try not to use anything too exotic on the cupcakes I post at EasyCupcakes.com, but if you see something you don't have, just try something else. I like the stark contrast of black M&Ms, but brown works perfectly fine. If you don't have red hots, use red mini M&Ms. And fruit rolls and chewy candies can be shaped into just about anything. My latest favorite is candy-coated sunflower seeds. You've definitely got to get some of those! 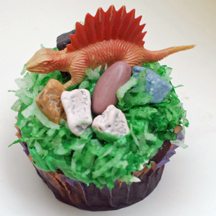 For me, one of the best things about decorating cupcakes is the chance to see things in different ways. You get "cupcake vision" and start imagining every food item you see as it would adorn a cupcake. Once you're hooked, you'll never look at a pretzel stick the same way again. It could be a fishing rod, a fencepost or George Washington's ax. Coconut turns into grass, dirt, hair or Santa's beard. A Bugle (from the chip row) is a cornucopia, or a unicorn's horn. Look to blogs, magazines and cookbooks for inspiration, but don't hesitate to put your own spin on any cupcake designs you see. Cupcakes inspire creativity. 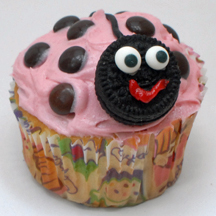 Once, I was working on a bee cupcake, and my son suggested, "Why don't you use some black licorice for a stinger?" I never would have thought of that. And it sounds corny (candy corny?) but that's what I like the absolute most about cupcakes: They bring out the kid in you. Great ideas! Thanks for the advice! Is the 1M tip an open star tip (Wilton 2110)? Just wanted to make sure I'm looking for the right one. Thanks!